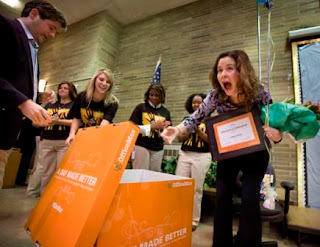 On October 2, 2008 OfficeMax surprised 1,300 teachers in the neediest classrooms nationwide with $1,000 gift of school supplies. The teachers were chosen in conjunction with the charity Adopt-A-Classroom. The $1,000 is just about the perfect amount. A NEA survey of teachers found that they spend an average of $1,200 a year on classroom supplies to make up for budget shortfalls. OfficeMax’s inelegant name for the campaign is “A Day Made Better.” And while it’s not cause marketing in the usual sense of the term, it is a whole new flavor of corporate philanthropy. But that has more to do with a new class of charities, of which Adopt-A-Classroom is one of many, than it does with this campaign. Founded in 1998, Adopt-A-Classroom allows teachers to make direct appeals to donors. A teacher who needs materials she won’t get from her school or district can make a direct appeal via the Adopt-A-Classroom website. Another charity in this space of a more recent vintage is DonorsChoose.org, founded in 2000. If you’re thinking this isn’t a whole lot different than some of the microenterprise donation charities, you’re right. Like no technology before, the Internet has shrunken the globe and made direct person-to-person appeals possible. People are going to hate this analogy, but this Internet-enabled philanthropy is the most direct giving you can do this side of putting a few coins in a beggar’s hand. By that, I don’t mean that teachers are beggars. Only that most charitable appeals have at least three degrees of separation between the donor and the ultimate beneficiary. Whereas with Adopt-A-Classroom it’s just the teacher and the donor. I interviewed OfficeMax’s spokesperson, Beth Cleveland, about the campaign. Other organizations that are nominally in this same space, how did OfficeMax come to choose Adopt a Classroom? In 2007, OfficeMax declared education as its companywide cause and began seeking a nonprofit partner in the space. OfficeMax came across Adopt-A-Classroom, which offers the public a simple web tool for literally adopting a teacher anywhere in the U.S. with 100 percent of proceeds benefiting the teacher…plus, donors receive an impact report that defines exactly how each penny was spent to benefit the classroom. Because Adopt-A-Classroom’s donation formula fully benefits the teacher, ensures responsible spending by the teacher and had proven successful for ten years, OfficeMax found a partnership with Adopt-A-Classroom was a natural fit. When did A Day Made Better start? took place on October 2 where 1000 teachers were surprised at 1000 schools across the country with $1000 worth of classroom supplies. How long is OfficeMax’s commitment to ADMB? inaugural surprise event to benefit teachers, call attention to the national problem of teacher-funded classrooms, and encourage widespread public support for educators every October. How will you measure ADMB's success? We are measuring the success of ADMB by examining the impact the event had on donations to AdoptAClassroom.com, which greatly increased following the 2007 event. We expect even greater results this year with 300 additional schools added to the “A Day Made Better” surprise event. We are also looking at the impact the event had on education and awareness of teacher out-of-pocket spending through traffic to www.ADayMadeBetter.com, membership to the Facebook “Cause” page and national media coverage (broadcast, print and online). Notable media coverage includes feature stories in The Washington Post, Miami Herald, San Jose Mercury News, FoxNews.com, BrandWeek, In Touch Weekly, New York Post, and ABC/CBS/NBC news stations in DC, Chicago, Miami, Los Angeles and other top markets.